Speaking on “Transparency and Empowerment in Decision-Making are Pillars of a Healthy Democracy” at the Inaugural RTI Lecture organised by Moneylife Foundation's RTI Centre at Pune, retired Justice A. P. Shah, on Saturday, urged the citizenry to demand accountability from the State, in view of the rising trends of the media disseminating “disinformation” by according a pro-government bias to the news. Addressing the present times as the “age of propaganda”, the former Chief Justice of the Delhi High Court regarded “media coverage” instead of as “blackout” on account of which the right to freedom of speech and expression is being curtailed. Referring to the instances of films such as ‘Padmaavat’ and ‘Lipstick Under My Burqa’ being compelled to modify content despite CBFC certification so as to refrain from hurting sentiments of a specific community, and of journalists being attacked for mere propagation of views, he stated, “The right to dissent is being abridged, more so in the university space as well as in popular culture”. 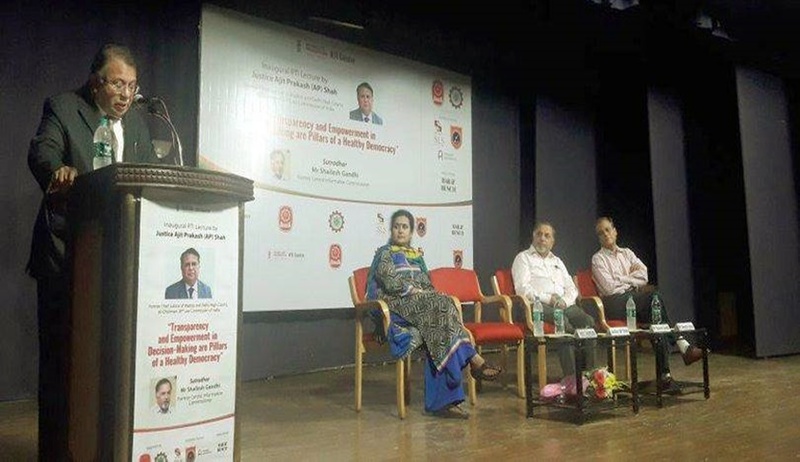 Emphasising on the significance of electronic media, Justice Shah lamented the culture of writing off as “anti-national” any opinion that is not acceptable to the government and excessive “online trolling and harassment” for expression of such views. He also cited the gradual weakening of the institutions of the Election Commission and the Central Information Commission, which were once regarded as the beacons of independence. Stressing on the need to open political parties to public scrutiny within the framework of the RTI Act, he criticised the objections raised thereto by political parties on the grounds that are not a ‘public authority’ and that revealing the details of their donors would pose a threat to the security of the donors. He cited the recent judgment of the Supreme Court in Lok Prahari v. UOI, wherein the apex court has required elections candidates to disclose the sources of income of their associates as well as dependents in addition to their own. Criticising the vagueness in the RTI Act, in so far as its Section 8(1)(j) provides an exception to the disclosure of information 'which relates to personal information… which has no relationship to any public activity or interest, or which would cause an unwarranted invasion of privacy’, he stated that since the Act does not define ‘privacy’, ‘public activity’ and ‘unwarranted invasion’, the said provision acts as an instrument for rejection of genuine RTI queries. Remarking that the 2017 Justice K. S. Puttaswamy judgment does not discuss the interface between the right to privacy and the right to information, the judge advanced that the judgment has created uncertainty in respect of sensitive topics such as the degree of the Prime Minister or the assets and liabilities of public servants, or their performance evaluation reports. In the light of the ongoing challenge to the constitutionality of the Aadhaar (Targeted Deliveries of Financial and Other Subsidies, Benefits and Services) Act of 2016, he exclaimed, “The proviso to sec. 28(5) of the Aadhaar Act restrains an Aadhaar number holder from having the right to access core biometric information about themselves- this implies that while the State can access my fingerprint and iris scan, I, myself, am prohibited from accessing my own personal, confidential information”. Stating that the position of the Indian judiciary on the guaranteeing of the right to information is mixed, he advanced, “in respect of Each judgment, like that SP Gupta and Raj Narain, there is a corresponding judicial decision by evasion. The best example of this would be the continuing pendency of the appeal filed by the Supreme Court to itself against the 2009 decision of the Delhi High Court in Subhash Chandra Aggarwal, while the effect of the High Court judgment has been nullified”. He lamented the non operationalisation of the Whistleblower’s Protection Act which was passed by the Parliament in 2014. He also criticised the bill introduced in 2015 to amend the Act with a view to remove the safeguards from prosecution available to whistleblowers where any disclosure is covered by the Official Secrets Act, and to prohibit any disclosure which is deemed to harm the sovereignty, integrity, security, strategic, scientific or economic interests of the State. The judge also criticised the non-operationalisation of the Lokpal and Lokayukta Act. Referring to the section 4 of the RTI Act, mandating all public authorities to make suo motu periodic disclosure of information under specified heads, he remarked that because the said provision has not been complied with, 70% of the RTI queries relate to data that should have been proactively disseminated by the governmental authorities. “The hallmark of a democracy is that citizens have the right to question the government on its actions. For this, it is indispensable that adequate information about government policies and decisions is made accessible to the public”, he concluded.